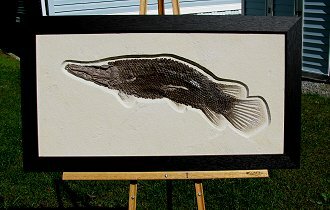 Size: Gar is 21.5 inches long, frame is 16" X 29"
This is an incredible fossil fish. It is a large Lepisosteus (Fossil Gar) from Wyoming. A complete Fossil Gar is one of the most sought-after fossil fish in the world! This type is one of the largest and rarest fossil fish from the Green River Formation. Lepisosteus was a fierce predator, having a long, narrow mouth FULL of sharp teeth - this specimen has the long teeth intact and well displayed! This type is also known for its large rhomboid scales, which are intact and beautifully preserved on this specimen. This fish also shows great detail on the fins and tail (see photo). This Gar is almost TWO FEET LONG and is almost perfectly centered on the matrix plate that has been professionally framed for optimal display! 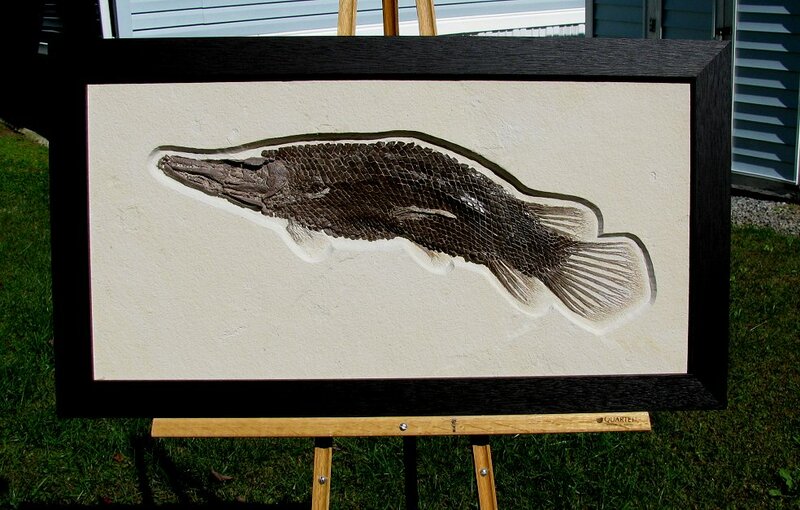 This is a phenominal example of one of the most collectible and displayable fossil fish one can own. It is a museum-type fossil that would look great in one's home or office.